The room, which is perfect for a family. Enough space for 4 people. Wheelchair friendly, which is important to us. I was satisfied with the room location parking and hygiene. We could bring our mountainbike to our room. The staff was nice. There is no complete walls for the bathroom to the bedroom and so there is very little privacy. The access to get to the room was terrifying with strong winds and rain over a bridge to get to your room. The main building is nice and it is a plus that both climbing and bowling is within the facility. Climbing for kids is Saturday 1030-1200 The breakfast is good. In the stadium, perfect big family room for a Sittard game! We stay here in a big group every year for a sports event. It's perfect for this ; plenty of space, great facilities, great value for money. City Resort Hotel Sittard This rating is a reflection of how the property compares to the industry standard when it comes to price, facilities and services available. It's based on a self-evaluation by the property. Use this rating to help choose your stay! Offering a restaurant, a fitness center, a climbing wall, a bowling center, and meeting facilities, City Resort Hotel Sittard is located in Sittard on the edge of Fortuna Stadion. In addition, guests can make use of wellness facilities at a surcharge. Free WiFi access is also offered. Rooms here will provide you with a flat-screen TV and a safety deposit box. Featuring a shower, the private bathroom also comes with a hairdryer and free toiletries. Extras include a desk. In the Wellness resort one can enjoy a day of relaxation. There are several hot and cold pools, saunas, steam cabins, beauty treatments, Hammam, Rasulor and traditional sauna rituals. 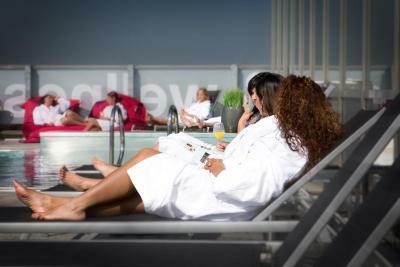 At City Resort Hotel Sittard you will find a 24-hour front desk, a terrace and a bar. Other facilities offered include luggage storage. 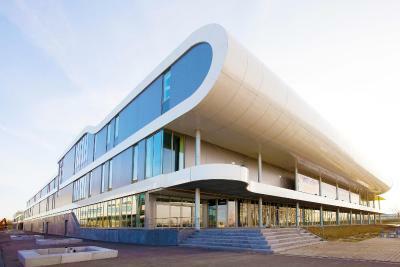 Maastricht Airport is 6.2 mi away and the city center of Maastricht can be reached within 20 minutes by car. 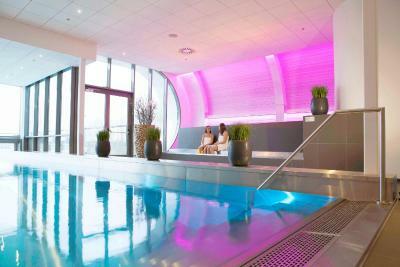 When would you like to stay at City Resort Hotel Sittard? This room is modernly decorated with a twin bed and has a bathroom with a shower and toilet. The bathroom provides all required amenities. The room has coffee/tea facilities, free WiFi, a television, safe, desk and seats. This room can accommodate up to 4 people bedroom. The room features 1 double box spring bed and a bunk bed. Free WiFi access, a TV, a seating area and a well-equipped bathroom are also provided. This room is modernly decorated with a queen size bed and has a bathroom with a shower and toilet. The bathroom provides all required amenities. The room has coffee/tea facilities, free WiFi, a television, safe, desk and seats. House Rules City Resort Hotel Sittard takes special requests – add in the next step! ATM card Debit card City Resort Hotel Sittard accepts these cards and reserves the right to temporarily hold an amount prior to arrival. City Resort Hotel Sittard accepts these cards and reserves the right to temporarily hold an amount prior to arrival. Use of Wellness facilities are not included in the roomrate. The Wellness resort is located in the main building which is directly accessible from the hotelrooms. The wellness facilities are for men and women. Please note that a bathrobe and slippers, which are available at the wellness reception, are mandatory in the wellness center. Swimwear is only allowed on Tuesdays. Please note that children from 12 years old are welcome to use the wellness facilities every day. Children between 4 and 12 years are only allowed on Sundays between 10:30 and 18:00. More information on the possibilities of the wellness center can be provided at the reception. Very noisy despite asking for a quiet room - other guests making lots of noise into the early hours. Couldn't ring reception despite pressing every button on the phone - turns out the number was on the television (which we didn't turn on), After little sleep drilling and banging then started at 7am with workmen on the side of the building. No folder containing information in the room - no details of the restaurant, climbing wall, gym, bowling etc. Room a good 5 minute walk from reception desk across an outside gangway (not mentioned when booking) - hence we didn't walk down to reception to complain about the noise. Overall the room was a good size but terrible nights sleep and had spent the night before trying to sleep on the ferry so we were pretty tired. Location good, near food outlets if needed. Breakfast excellent. We booked this hotel because it was with swimming pool. BUT children ARE NOT allowed on the swimming pool. This is not specified on the hotel's description and was very big disappointment for us. Our floor and room carpet looked dirty. Breakfast was overpriced. The room was located to far from the enterence. You had to walk a lot before you can get out. The family room is a good size but the toilet and shower is the same standard as in public restrooms. When showering the humidity is spread to the room as there is no real door to close. The same goes for the toilet. There is no privacy and the odour is also spread to the room.